A CD is an investment that guarantees growth and safety. Earnings rates and terms are fixed. But Access Community Credit Union’s new CD goes two steps better. 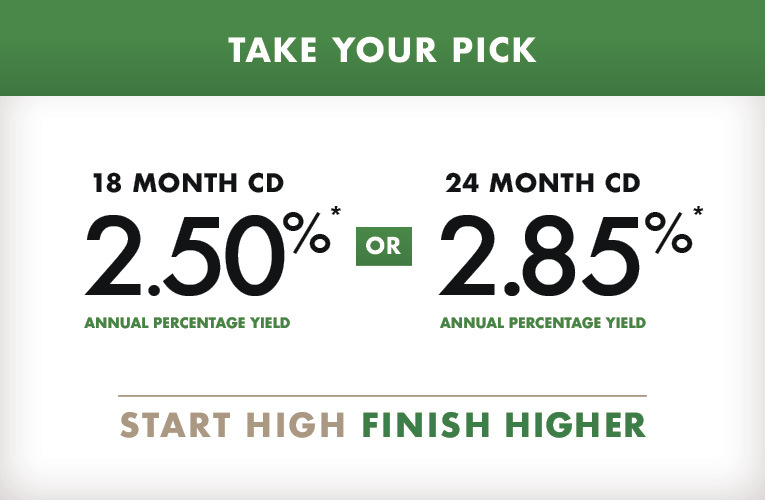 If rates go up, our TIMES2 CD rate steps up also. Two times on CDs of $100,000 and up, or one time on CDs below $100,000. This enables you to grow with the market. Plus, your savings are federally insured to at least $250,000 and backed by the full faith of the United States Government. This is a limited time offering. Only new Times2 CDs of $100,000 and higher will qualify for 2 step-ups during the life of the CD. New Money Only. New CDs of $99,999 and lower will qualify for 1 step-up during the life of the CD. New money only. $5,000 minimum. All step-up CDs are NOT eligible for promotional rate increases. All TIMES2 CDs are capped at a 1.00% step up. *These certificates of deposit will have a fixed rate, however, during the term of the CD, the member will be allowed to increase their rate two times on a $100,000 or more CD and one time for CDs under $100,000, to ACCU’s current stated rate with the same original term. Once the rate is changed, it will remain in effect the duration of that term. For early withdrawal penalties, please refer to the CD Penalty Disclosure.